Designed by Carl Alberg in 1958, the classic Pearson Triton gained a dedicated following in the boating community that still exists today. It has a rich class history with folklore surrounding the boat's conception and construction. 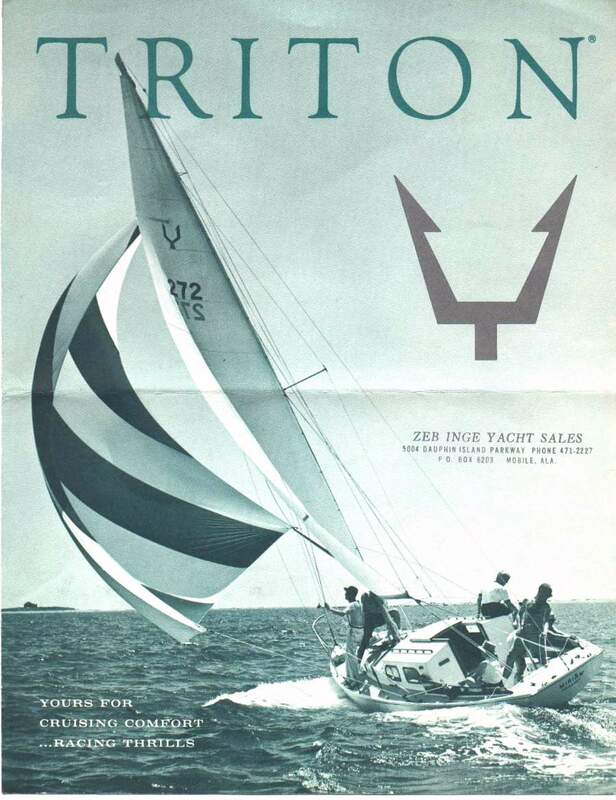 When asked about the Triton's popularity and success, Alberg replied: "She hit the market at the right time - there was no other boat like her available. By using fiberglass, we had much more room inside, about the same as you would find in a wooden 35-footer. The Pearsons built in a very nice interior, one that seemed to satisfy the needs of the average buyer". The boat was initially designed to be constructed as a wooden boat. The plans were brought to the Pearsons by Tom Potter, who joined them in the production. They worked with Alberg to adapt the plans for fiberglass construction techniques, one of which was the implementation of a mat/roving laminate for the hull. 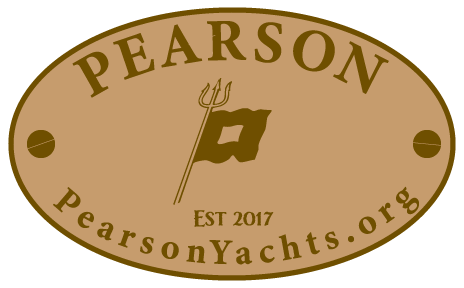 Pearson said "We designed the hull laminate from the waterline down so that the boat, laid over on its side with the entire weight of the boat resting on the keel and one square inch of the hull would yield not more than 1/2 inch and produce no structural damage to the boat". The Triton is one of those rare 28 foot boats that have actually circumnavigated, more than once (See references to the Voyages of Atom). 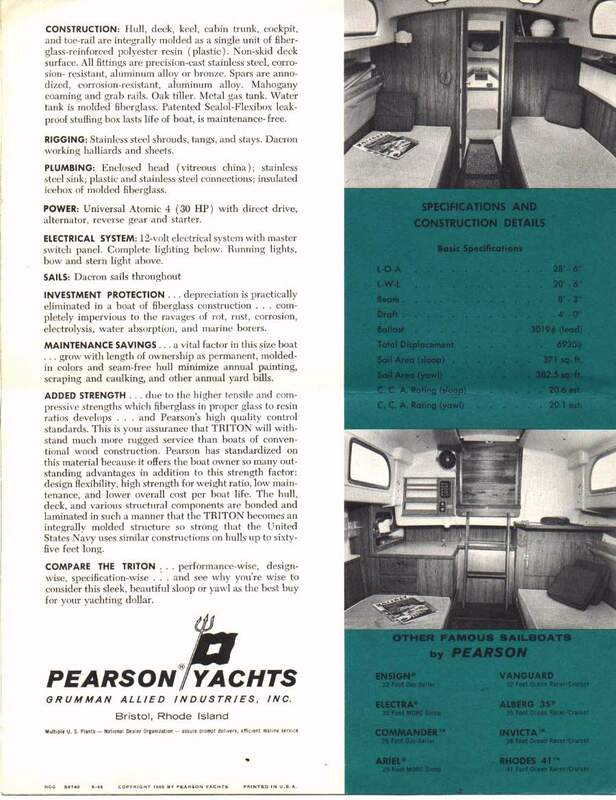 When the Pearson's had the opportunity to show hull #1 at the New York City Boat Show in 1959 they spent 3 1/2 days working around the clock while sleeping on board. They had not finished wiring the motor when they loaded it at 2AM for the trip to NYC. The boat was an immediate hit and the Triton went viral at the show where 18 cash deposits were received by the Pearsons. 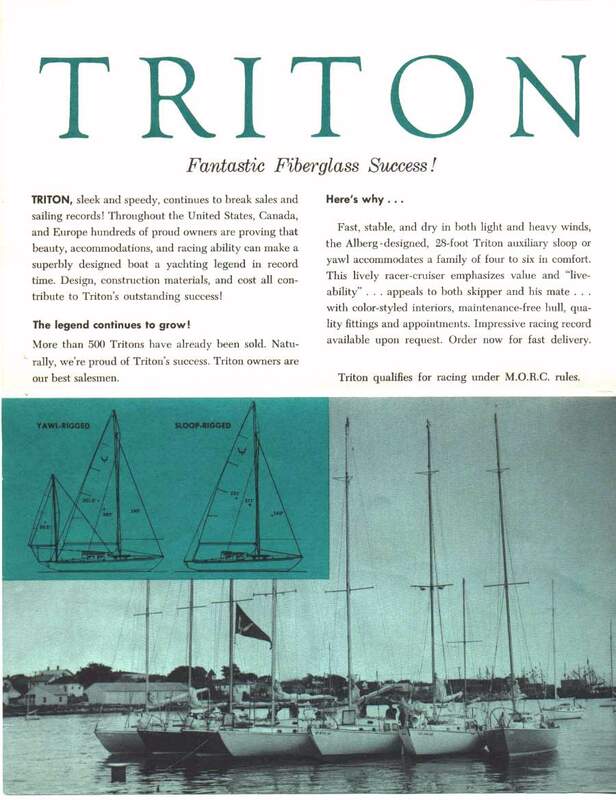 Constructed in response to a request for a "28-footer that sleeps four", the Triton went on to become one of the first successful productions of fiberglass auxillary sailboats in the country. 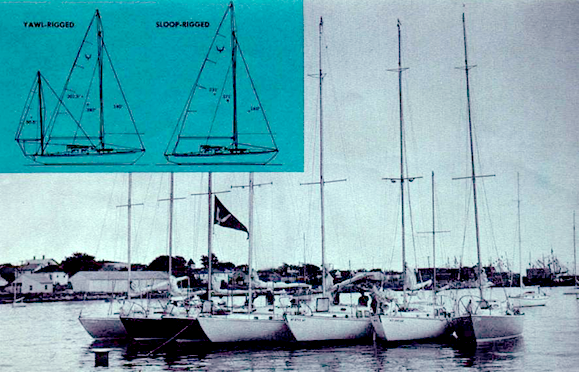 The Triton came with sloop or yawl rig options and a moderately long keel that drew 3'11", with a displacement of 6,930 pounds. Her auxiliary power was a 25-hp Universal Atomic-4. Alberg gave her a wide flare forward for both dryness and working on deck. Another factor in Triton's marketing success was her pricing. 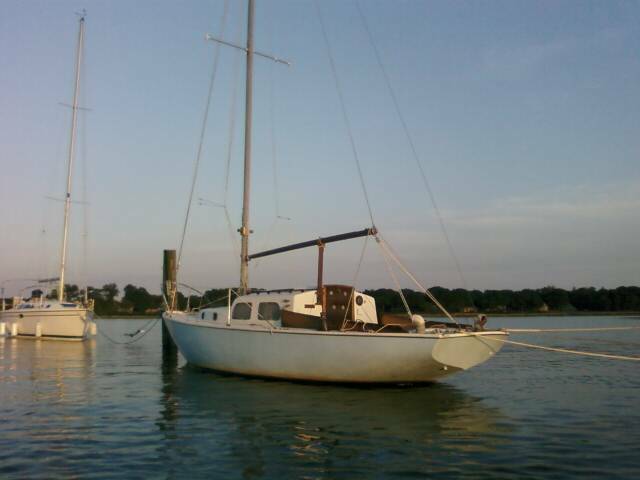 Alberg recalls that she first came out at a bareboat price of $9,700. Over the next seven years, Pearson, which became a Grumman subsidiary, sold 750 of the design before stopping production in 1966. In the early 1960's Aeromarine in California built some 125 boats. They're easily distinguished from their East Coast mentors which have wooden coamings and wooden trim, while the West Coast boats are all plastic. Also a variety of rigs were used on West Coast boats – which did not meet the original design. 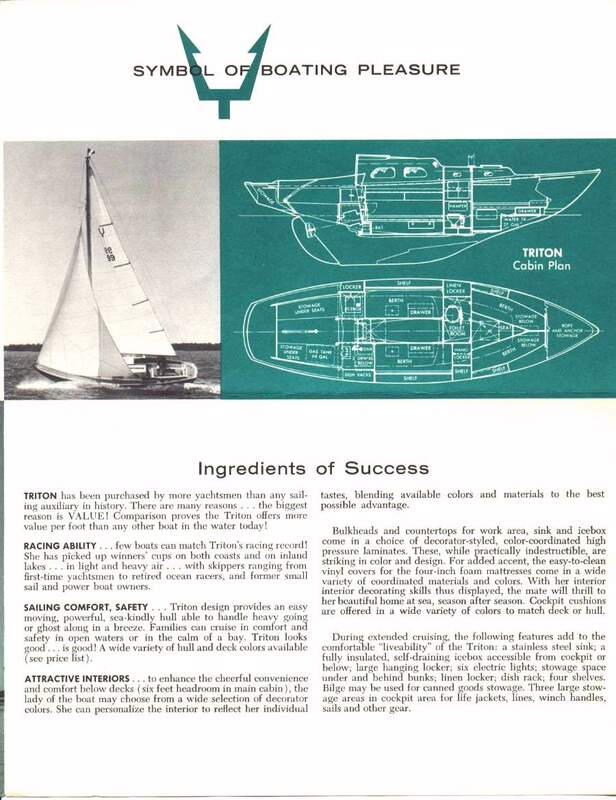 Early 1960's Brochure, Pearson Yachts Inc.
TRITON, sleek and speedy, continues to break sales and sailing records! Throughout the United States, Canada, and Europe hundreds of proud owners are proving that beauty, accomodations, and racing ability can make a superbly designed boat a yachting legend in record time. Design, construction materials, and cost all contribute to Triton's outstanding success! The Legend Continues to Grow! More than 500 Tritons have already been sold. Naturally, we're proud of Triton's success. Triton owners are our best salesmen. Here's why... Fast, stable, and dry in both light and heavy winds, the Alberg-designed, 28-foot Triton auxiliary sloop or yawl accomodates a family of four to six in comfort. This lively racer-cruiser emphasizes value and "liveability" ... appeals to both skipper and his mate ... with color-styled interiors, maintenance-free hull, quality fittings and appointments. Impressive racing record available upon request. Order now for fast delivery. Triton qualifies for racing under M.O.R.C. rules. TRITON has been purchased by more yachtsmen than any sailing auxiliary in history. There are many reasons... the biggest reason is VALUE! Comparison proves the Triton offers more value per foot that any other boat in the water today! 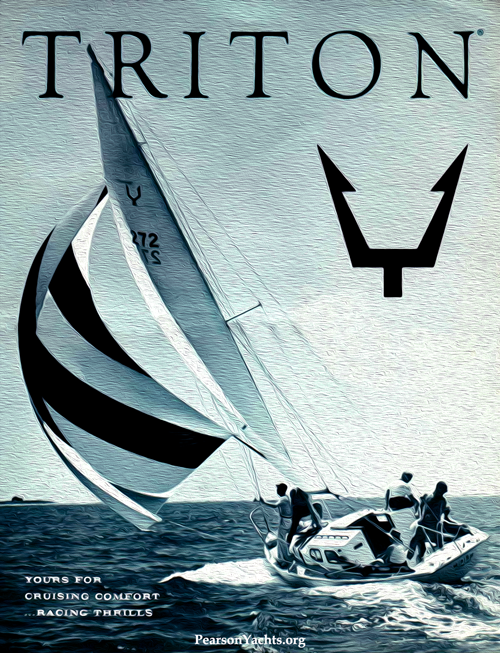 RACING ABILITY... few boats can match Triton's racing record! She has picked up winners' cups on boat coasts and on inland lakes... in light and heavy air... with skippers ranging from first-time yachtsmen to retired ocean racers, and former small sail and power boat owners. SAILING COMFORT, SAFETY... Triton design provides an easy moving, powerful, sea-kindly hull able to handle heavy going or ghost along in a breeze. Families can cruise in comfort and safety in open waters or in the calm of a bay. Triton looks good... is good! A wide variety of hull and deck colors are available. ATTRACTIVE INTERIORS... to enhance the cheerful convenience and comfort below decks (six feet headroom in main cabin), the lady of the boat may choose from a wide selection of decorator colors. She can personalize the interior to reflect her individual tastes, blending available colors and materials to the best possible advantage. Bulkheads and countertops for work area, sink and icebox come in a choice of decorator-styled, color-coordinated high pressure laminates. These, while practically indestructable, are striking in color and design. For added accent, the easy-to-clean vinyl covers for the four-inch foam mattresses come in a wide variety of coordinated materials and colors. With her interior decorating skills thus displayed, the mate will thrill to her beautiful home at sea, season after season. Cockpit cushions are offered in a wide variety of colors to match deck or hull. During extended cruising, the following features add to the comfortable "liveability" of the Triton: a stainless steek sink; a fully insulated, self-draining icebox accessable from cockpit or below; large hanging locker; six electric lights; stowage space under and behind bunks; linen locker; dish rack; four shelves. Bilge may be used for canned goods stowage. Three large stowage areas in cockpit area for life jackets, lines, winch handles, sails and other gear. Hull, deck, cabin trunk, cockpit, and toe-rail are integrally molded as a single unit of fiberglass-reinforced polyester resin (plastic). Non-skid deck surface. All fittings are precision-cast stainless steel, corrosion-resistant, aluminum alloy or bronze. Spars are annodized, corrosion-resistant, aluminum alloy. Mahogany coaming and grab rails. Oak tiller. Metal gas tank. Water tank is molded fiberglass. Patented Sealol-Flexibox leakproof stuffing box lasts life of boat, is maintenance-free. Stainless Steel shrouds, tangs, and stays. Dacron working halyards and sheets. Enclosed head (vitreaous china); stainless steel sink; plastic and stainless steel connections; insulated icebox of molded fiberglass. Universal Atomic 4 (30 HP) with direct drive, alternator, reverse gear and starter. 12-volt electrical system with master switch panel. Complete lighting below. Running lights, bow and stern light above. depreciation is practically eliminated in a boat of fiberglass construction... completely impervious to the ravages of rot, rust, corrosion, electrolysis, water absorption, and marine borers. a vital factor in this size boat... grow with length of ownership as permanent, molded in colors and seam-free hull minimize annual painting, scraping and caulking, and other annual yard bills. due to higher tensile and compressive strengths which fiberglass in proper glass to resin ratios develops... and Pearson's high quality control standards. This is your assurance that TRITON will withstand much more rugged service than boats of conventional wood contruction. Pearson has standardized on this material because it offers the boat owner so many outstanding advantages in addition to this strength factor: design fexibility, high strength for weight ratio, low maintenance, and lower overall cost per boat life. The hull, deck, and various structural components are bonded and laminated in such a manner that the TRITON becomes an integrally molded structure so strong that the United States Navy uses similar construction on hulls up to sixty five feet long. performance-wise, design-wise, specifications-wise... and see why you're wise to consider this sleek, beautiful sloop or yawl as the best buy for your yachting dollar.